Are you struggling with a lot of upper back, neck and shoulder pain daily? Do you feel like it's time to finally correct that kyphotic, slouched-over posture? Have you tried posture correctors before but were disappointed in how uncomfortable they were? Either way, we invite you to try out the tool that will help you reduce your pain by slowly reversing your condition and becoming a healthier, pain-free and more productive version of yourself. 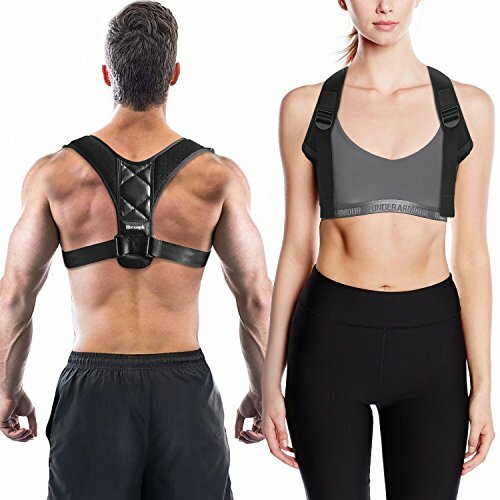 As soon as this posture corrector arrives in your mail, your first priority should be to wear it for half an hour at a time, until you become totally comfortable with it. Over time, you will be able to wear it every single day, before you go to work, school or run errands and you'll manage to release all the pressure from your upper and mid spine, neck and shoulders. Plus, since the body works as a kinetic chain, it's highly possible that fixing your rounded-shoulders and kyphotic posture might lead to a vast improvement in your lower back, hip or even knees. Not to mention, it doesn't require a second person to help you put it on. Just place it around your chest and pull two ropes to adjust its tightness. Scroll Up, Click 'Add To Cart' And Start Fixing Your Posture, One Day A Time! DESIGNED FOR ALL DAY COMFORT:Forget all about your chronic upper back and shoulder pain by wearing our comfortable and lightweight posture corrector and making sure your spine is always properly aligned. Perfect for people who suffer from kyphosis or simply those who sit in front of a desk all day, this clavicle brace will reduce or even eliminate all your back pain even from the first week of wearing it! NEW, UPGRADED, COMFORTABLE DESIGN: No more posture correctors that dig into your shoulders and are too complicated to wear and remove. The Lifesoph Back Posture Corrector features a practical and ergonomic design, since all it takes to wear and adjust it, is simply pulling two ropes! Keep it on throughout the day and you might even forget you're wearing it! PROPERLY ALIGN YOUR SPINE, NECK & LOWER BACK: Our therapeutic posture corrector was specifically designed for men, women and teenagers who require some extra back support throughout their entire day. Simply, start by wearing it for 20-30 minutes and gradually increase to 1 hour a day . By this, it would make your posture perfect and would then only have to be worn occasionally. BREATHABLE & DISCREET DESIGN: Our premium posture corrector offers strong back support and it's equipped with a breathable shoulder girdle design. The clavicle brace doesn't cause skin irritation or sweating, can be worn at home, work or gym. TAKE IT ONE DAY AT A TIME: If you're currently suffering from upper back and shoulder pain due to a kyphotic or hunched-over posture, do not be overwhelmed. Do not hesitate to get in touch with us if you have ANY questions or issues with the product and we will make it right. If you have any questions about this product by Lifesoph, contact us by completing and submitting the form below. If you are looking for a specif part number, please include it with your message.